Do away with the need for an SEO professional to manually assess keywords and make judgment calls on which keywords to include in the final list. Put’s Google Keyword Tool data into context. Complete it in half a day. Quickly refresh your keyword list once movement in keyword position has taken place. Great keyword research involves making keyword list refinement robust and efficient through the use of an algorithm based on several keyword metrics. You don’t have to have just one keyword research methodology. Different approaches should be used to get to the same great quality keyword list depending on the type of site you are working with. Now it’s time to address programmatic keyword research. Programmatic keyword research is the practice of trying to work out which modifying terms (“modifiers”) should be focused on at a page template level. Programmatic keyword research works well for a formulaic, themed site or part of a site. Some good examples are the product section of a retail website, or the recipe pages on a cookery site. If you can isolate which modifying prefixes and suffixes are the most popular, the client can optimise the rules behind their templates, and therefore realize a base level of optimization for all pages. For any given product or recipe, most search volume occurs around its name, so you should always optimize a product page with the actual product name before all other terms. However, many modifying terms will also be searched on a regular basis – this represents a large volume of additional traffic your client could capture. Based on our selected modifiers, we now have 10 keyword variants to test. The next stage is to substitute <recipe> for various actual recipe terms like “chocolate cake”, “muffins” or “cupcakes”. Then run these lists through Google’s keyword tool. Using the concatenate function in Excel you should be able to do this really quickly. In the duplicated sheet, create a formula in each search volume square that references the previous sheet with the raw keyword volume. In the duplicated sheet, calculate the mean of each search volume column. Multiply all of these mean figures by a factor high enough to raise all the values above 1. It is essential that you multiply all figures by the same factor. Once you’ve gone through this piece of work, you can work with the client developers to change the way the template page works. Once this has been implemented, you should see a rise in general visibility as your site increases its ranking for the huge number of long tail keywords that this work will impact upon. Does This Process Improve Keyword Research? When judged against our acid tests for judging whether this method makes for a good piece of keyword research, we can draw some conclusions. Does the process do away with the need for an SEO to manually assess keywords and make judgment calls on which keywords to include in the final list? Yes, all keyword modifiers are measured on the same basis and we can look at a large dataset very quickly which should eliminate anomalous data from influencing our SEO strategy. The process also puts Google’s keyword data into context as we divide each single data point into the total search volume for all variations of each modifier. This means we’re looking at relative search volume, not just each keyword’s individual popularity; an important point. The process can easily be completed in half a day, and you could quickly complete it for additional modifying terms if you believe your original research wasn’t comprehensive enough. Keyword research is hugely important. The success of your entire SEO engagement depends on getting this piece of work right. Why? Because an informed client will judge you on how visible their website becomes for the terms in their SEO keyword list, and that list is the product of your keyword research. Getting keyword research right should make your engagements run smoother, and your team should be able to focus in more detail on what’s going to move the needle for clients. 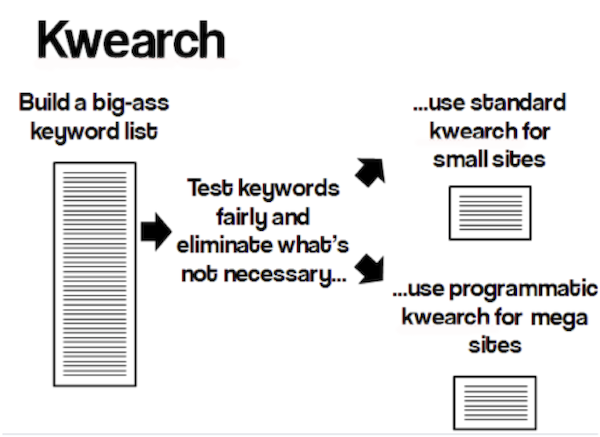 Hopefully these keyword research tips will help you to improve your keyword research. I’d love to hear your thoughts in the comments!